The Miami Heat duo of LeBron and Wade heaped the pressure back onto the Indiana Pacers as they took Game Four in Indiana by 8 points. LeBron especially had a ridiculous evening, scoring 40 points, pulling down 18 rebounds and adding 9 assists and 2 steals on the side. Unbelievable. Dwyane Wade had 30 points, 9 rebounds and 6 assists. 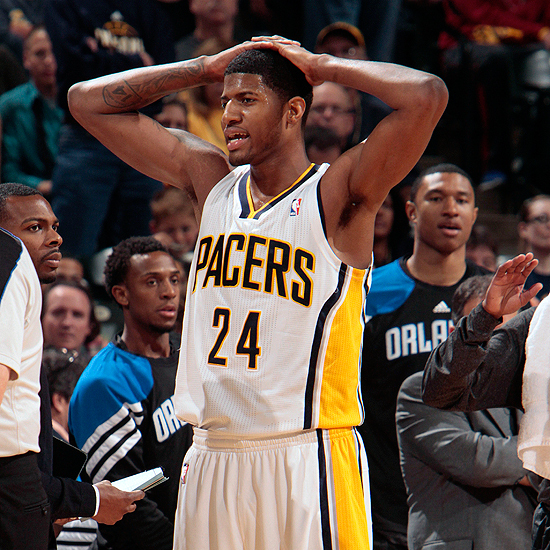 Danny Granger had 20 points to lead the Pacers in a losing effort. 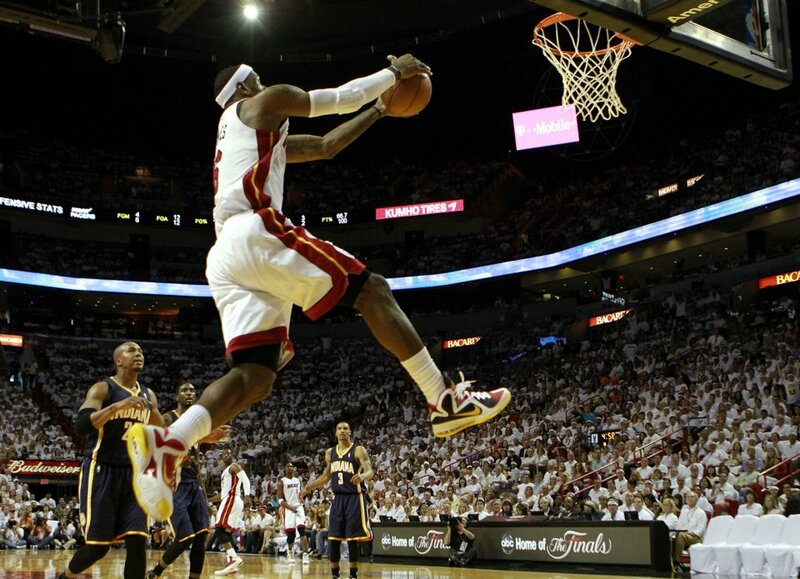 The Miami Heat took an early series lead as they took down the Indiana Pacers in Game One of their series. 3-time and newly crowned MVP LeBron James dominated the game with a match leading performance of 32 points, 15 rebounds and 5 assists. Dwyane Wade provided ample assistance as he scored 29 points. However, it was not all good news for the Heat as they lost Chris Bosh to an abdominal strain early in the game. For a team that struggles with size, the return of Bosh is paramount to this teams success. He may not be the best player in a Heat uniform but he may very well be the most important. — Pacers head coach Frank Vogel on Granger’s struggles. David West made the most of Chris Bosh’s absence, scoring 17 points and pulling down 12 rebounds. 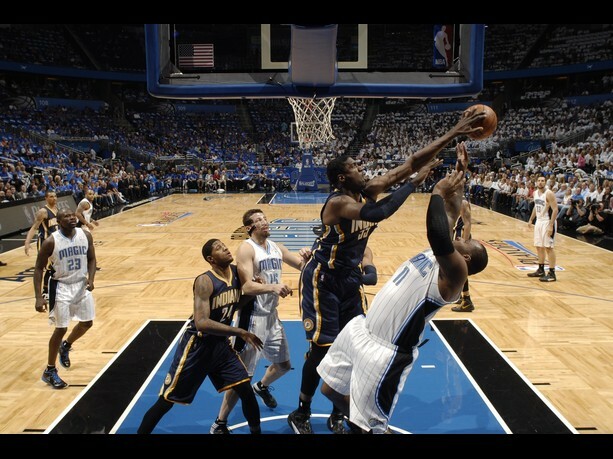 Center Roy Hibbert also played well as he scored 17 points and had 11 rebounds while fighting through foul trouble. Danny Granger on the other hand quickly realised that he would not be getting the same shots against LeBron as he did against the Magic, only scoring 7 points on 1-10 shooting. They sure fought hard and stood by thier coach, but in the end it was not enough as the Orlando Magic fell to the Indiana Pacers, losing the series 4-1. Jameer Nelson certainly did all he could to avoid the outcome as he poured in a game high 27 points in the final outing of his season. 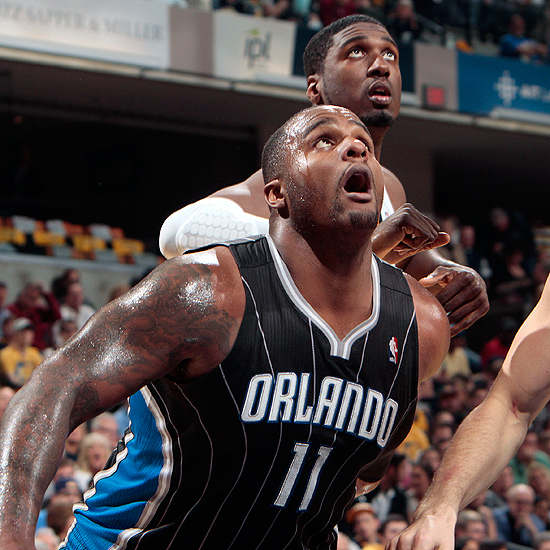 Glen Davis also worked hard once more for his 15 points despite being nearly hoplessly outsized. — Pacers forward Danny Granger. Roy Hibbert finally took full advantage of his size as he put in 18 points to lead the Pacers to a big 23 win in Orlando. Hibbert also ripped down 10 rebounds as Danny Granger had 26 points to make up for the lack of scoring presence from David West, who only had 3 points. The Magic on the other hand had few major contributors, with Hedo Turkoglu still struggling though injury and Jason Richardson and Ryan Anderson simply disappearing. Glen Davis was one of the few Magic players to win his match up, getting into the body of the taller Hibbert and ramming his way towards 22 points. One time ‘Big Baby’, Davis has stepped up and is seeming to thrive as the central cog for his team. Despite a brave game one victory, it look very unlikely that the Magic will get another victory in this series, let alone get through it. They simply do not have the quality, let alone the depth of quality. Look for the Magic and Stan Van Gundy to fight to the end, but expect the Pacers to win this one. The Indiana Pacers bounced back in the best possible way as they took down the Orlando Magic by 19 points. David West continued to pound the paint in Dwight Howard’s absence, scoring 18 points and pulling down 11 rebounds, also getting to the line ten times. Roy Hibbert didn’t provide a huge offensive boost but his 5 offensive boards helped keep possessions alive for the Pacers. The Magic were held to just 35 percent shooting and only 32 percent from down town in a mix of good defence and missed open shots. Glen Davis especially struggled mightily, only hitting 5 of his 16 shots but got to the line 10 times, hitting 8, to score 18 points and lead the Magic. He also pulled down 10 rebounds to help plug the rebounding gap Dwight leaves. Jason Richardson especially went from 17 points in game one to just two in the second. The saying that the Magic “Live by the three, die by the three” could not be anymore relevant in this game. Well the Magic achieved what many thought was impossible as the Magic took down the Pacers despite Dwight Howard’s absence. Roy Hibbert dominated the pain defensively in Dwight’s absence as he recorded 13 rebounds and 9 blocks to clog up the paint. But he was not able to have a great enough offensive impact as he only scored 8 points. David West on the other hand took full advantage of the situation as he had 19 points. The Magic scored the last 12 points of the game to achieve the difficult task. Danny Granger fumbled his way through the final quarter as he struggled down the stretch. Jason Richardson on the other hand knocked down a pair of clutch triples to help seal the game for the Magic. — Orlando head coach Stan Van Gundy. Glen Davis played big in Howard’s absence, scoring 16 points and pulling down 13 rebounds despite being blocked 6 times throughout the game. Jameer Nelson also had a near double double with 17 points and 9 assists as the Magic got the win they needed to be competitive in the series. Possibly one of the more exciting match ups of the Eastern Conference. Great contests at multiple positions and superstars littered all over the place. The highlight will no doubt be the competition between LeBron James and Carmelo Anthony, the two 2003 alumni likely wanting the win over their compatriot. Both teams love to get out on the fast break, but its not secret that a big step towards stopping the Miami Heat is halting the run of Dwyane Wade and LeBron James. Amare Stoudemire’s play against Chris Bosh will be interesting to see, with Bosh having to deal with the physicality of Stoudemire, something he has shown in the past to dislike. Tyson Chandler’s shot blocking and ability to fill up the paint will also be essential in stopping the drives of Wade and James. Possible upset, but Miami likely to get the win. Injuries will definitely be the determining factor in this series. The Pacers have quietly gone about having a good season as they secured the number three seed and Dwight Howard’s injury will make their playoff run much easier. David West, Danny Granger and co. will have a much easier time scoring in the paint without Dwight’s intimidating presence in the middle. Howard is really the only defensively minded player on the Magic team and they will struggle without him. Hedo will have to turn back to clock and Ryan Anderson will need to play out of his skin to force David West to play defence all the way out of to the three point line if the Magic are able to fit the series win here. Unlikely though. Western Conference previews up before too long!